The 2019 Nissan Versa is among the cheapest sedans you'll find on today's market. Because of the Versa's roomy design and good fuel economy, it's perfect match for the families who are trying to save money. While the base S model is a sweet deal, stepping up to the top-of-the-line SV trim allows you to experience a bit more luxury. However, does the new Versa bring enough to the table? This year, Nissan's optional SV Special Edition package includes more goodies, including Apple CarPlay and Android Auto smartphone integration. Don't expect to see any other big changes on the new Versa. The 2019 Nissan Versa is a clearly budget-friendly automobile. Prices start at less than $12,500. Although the base Versa isn't loaded with technology, it has enough to keep the average driver happy. Some of the standard equipment includes a 7.0-inch touch screen, a backup camera, and Bluetooth support. Even the most expensive version of the Versa is still priced below $17,000. A 60,000-mile powertrain warranty also comes with your purchase. Not only does the 2019 Nissan Versa have an inexpensive price tag, but it's also cheap to maintain. Regular maintenance, such as oil changes and brake pad replacements, should break the bank. You'll also enjoy the Versa's fuel-saving design. When paired with an automatic CVT, it can return a combined 34 mpg on regular gas. Manual-equipped models are just a bit less economical. However, most drivers won't complain about getting 30 mpg. Nissan tuned the Versa's suspension to deliver a soft ride. This is a huge plus for the drivers who must commute on a daily basis. Although the 2019 Nissan Versa is known as a good city car, it's also great for highway road trips. Even when encountering rough asphalt, the Versa still manages to effectively soak up the bumps. While there are definitely better handling cars in this price range, they may not match the Versa's overall comfort. The base 2019 Nissan Versa has a rather bland look. Drivers seeking more style should opt for the SV Special Edition package. It transforms the Versa into a far more interesting car. You'll immediately notice the package's attractive alloy wheels, which are much cooler than the standard hubcaps. Meanwhile, a rear spoiler gives the Versa a bit more charisma. Some of the popular colors include Deep Blue Pearl, Fresh Powder, and Gun Metallic. Although the 2019 Nissan competes against other subcompact sedans, it has no trouble accommodating a full-size family. A big backseat gives the Versa a key advantage over some competitors. Not only will rear passengers have ample knee room, but parents can also easily install a child safety seat. This inexpensive car boasts an impressive cargo capacity as well. With around 15 cubic inches of trunk space, the Versa is nearly just as practical as a midsize sedan. Although the Versa may not offer advanced driving aids such as blind-spot monitoring, it does provide great outward visibility. When attempting to switch lanes on a busy freeway, you'll be able to quickly check for oncoming vehicles. The Versa's expansive view of the road is especially beneficial for inexperienced drivers. Large windows give them an extra sense of security. The Nissan Versa’s minimalist interior design will appeal to a lot of people. It’s a great car for the folks who don’t care about being surrounded by high-tech features. You can adjust its climate control system by simply turning a dial. Drivers will also have no trouble using the Versa’s basic stereo system. Drivers will enjoy the Versa’s simple touch-screen display. While it’s not the most advanced infotainment system, very few people will complain about its usability. Integrating your smartphone to the system only takes a few seconds. The interface also benefits from voice recognition, which helps you to avoid becoming distracted while at the wheel. Every year, more and more cars are started to forgo manual transmissions. Fortunately, the 2019 Nissan Versa continues to offer a traditional stick shift. Although the available CVT is more efficient, some drivers will find the manual gearbox to be a bit more fun. It actually helps the 2019 Nissan Versa to accelerate just a tad quicker. If you live in the city, you’ll grow fond of the Versa’s tight turning radius. It’s less challenging to park than a midsize sedan. When trying to squeeze into a confined area, you won’t have to struggle as much. Drivers seeking a lot of performance will be disappointed with the 2019 Nissan Versa. While its engine produces an adequate 109 horsepower, this isn’t enough muscle to excite most people. The Versa’s acceleration is quite pokey. It takes around 9.2 seconds for the sedan to reach 60 mph. Road handling also isn’t the Versa’s strong suit. Expect the 2019 Kia Rio to be far more engaging to drive. The 2019 Nissan Versa is obviously an economy car. Unsurprisingly, its cabin feels a bit cheap. Some of the interior materials are subpar. Hard plastics are found throughout the new Versa. Furthermore, the base model forces you to use old-school crank windows and non-powered door locks. Although the range-topping Versa SV is more modern, it still won’t wow you with its build quality. Nissan does not offer any advanced driving aids on the new Versa. Although every trim is equipped with a backup camera, you won’t be able to obtain safety innovations such as automatic braking and blind-spot detection. Even parking sensors are not available on the new Nissan Versa. On the other hand, forward collision warning with automatic braking actually comes standard on the 2019 Toyota Yaris iA. The standard four-speaker system leaves much to be desired. Most music fans will find it to be weak and uninspiring. Unfortunately, you also can’t upgrade to a more powerful sound system. When driving the base 2019 Nissan Versa S, you definitely won’t stand out. It comes equipped with a bland-looking set of steel wheels. You also don’t get a rear spoiler on the base Versa. If style is a high priority, your best bet is to spend the money on the SV Special Edition package. The 2019 Toyota Yaris iA is one of the Nissan Versa’s key competitors. In terms of performance and available features, the Yaris has a big advantage over the 2019 Nissan Versa. Nevertheless, families will likely prefer the Versa’s roomier design. The new 2019 Ford Fiesta sedan also deserves a look. Although the Fiesta has a cramped backseat, drivers rave about its sharp handling. Ford’s excellent Sync 3 infotainment system will also appeal to a lot of car shoppers. You may also be considering the 2019 Kia Rio. It’s among the best cars in the segment. Drivers will enjoy the Rio’s high-quality interior and more energetic engine. You can also take advantage of the Rio’s 100,000-mile powertrain warranty. Drivers who are low on cash should definitely consider getting the 2019 Nissan Versa. It’s a spacious family car that does not break the bank. Because of the Versa’s high fuel economy and soft ride, it’s a solid commuter car. Not only does the SV Special Edition package make the Versa look more stylish, but it also rewards you with Apple CarPlay and Android Auto smartphone integration. On the downside, America’s cheapest sedan does force you to sacrifice a bit of quality. Nissan also doesn’t give you access to any advanced safety features. The Versa’s uneventful performance is yet another weak point. • Why Buy a 2019 Nissan 370Z? • Why Buy a 2019 Nissan Altima? • Why Buy a 2019 Nissan Armada? • Why Buy a 2019 Nissan Frontier? • Why Buy a 2019 Nissan Kicks? • Why Buy a 2019 Nissan Leaf? • Why Buy a 2019 Nissan Murano? • Why Buy a 2019 Nissan NV200? • Why Buy a 2019 Nissan Pathfinder? • Why Buy a 2019 Nissan Rogue? • Why Buy a 2019 Nissan Sentra? • Why Buy a 2019 Nissan Titan? • Why Buy a 2019 Nissan Titan XD? 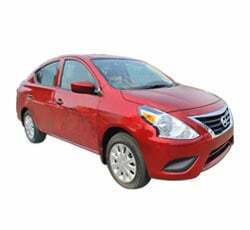 • Why Buy a 2019 Nissan Versa?